Her Peaceful Garden: Week 4 (FINAL) ATC Birthday Party - "AND THEN......CHOCOLATE!!!" Week 4 (FINAL) ATC Birthday Party - "AND THEN......CHOCOLATE!!!" So HURRY before the gates close!!! Oh, yummmmmmmmy....I do love chocolate!! 1. Favorite variety: milk chocolate over dark chocolate every time! 3. Favorite candy bar: Kit Kat (naturally) but Heath is a close second....and Almond Joy....and Snickers....and PB M&Ms.....and Reese's PB cups.....and Rolo....and Twix.....and....and....and.... oh, my goodness...make me stop!!! 5. Favorite cookie: Homemade chocolate chip with walnuts...but I love OREOs, too! 10. Favorite Add-Ins: Toffee, nuts, caramel, dried fruit, malt, mint. 11. Other chocolate favorites: Classic Almond Roca, Lindor Truffle balls, Malt balls with REAL milk chocolate covering. Here is the chocolate ATC I made to share with you. It has chocolate chip cookies and a box of chocolates on it....and some OREOs in the background. :) Sorry I couldn't get a decent glare-free photo. 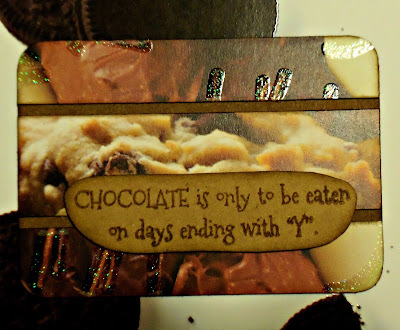 So............now it is your turn to make a chocolate-themed ATC. It can be chocolate in any of its many forms. (Except NOT as a fat 60-year-old lady!! Ha!!!) But you can use a chocolate cupcake, chocolate candy bar, chocolate chip cookie, etc.....feel free to get ideas from my favorites list above!! Thank you so much for the wonderful ATCs you have made so far. Remember that there will be a prize randomly awarded to one participant in each of the four weekly challenges plus one for the blog badge giveaway....5 prizes total. So be sure to post my ATC BD blog badge in your sidebar and participate in each of the weekly ATC theme challenges for the best chance of being drawn. You can enter the badge giveaway and any of the weekly challenges until Saturday, 11:55 pm Pacific, March 3, 2018. Now.....I want to show you the lovely BD surprises I got in the mail from Gail (Ionabunny)!!! 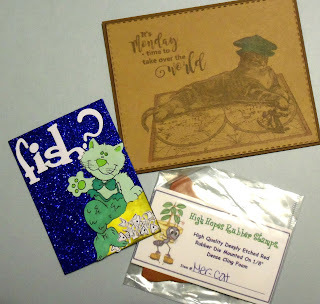 She sent me the super-fun Mer-cat ATC she made for Week 1 PLUS a Mer-cat stamp!! Also this furrrrrabulous Cat-ifer Columbus BD card. I wish my photography were better. Totally doesn't do justice to this amazing card!! THANK YOU, GAIL!!!! Remember this is the FINAL week to enter the 4 weekly ATC challenges and the Blog Badge Giveaway. Everything closes Saturday, 11:55 pm Pacific, March 3, 2018. Thank you for indulging me with my crazy ATC Birthday celebration idea!!! I hope you have had fun. I can't wait to see your chocolate-themed ATCs!!! Yes, I can do chocolate! I could not figure out what the final C would be so this is awesome! So funny, KitKat is my favourite chocolate bar too! I try to stay away from chocolate because although I like it, it doesn't like me! Look at the nice package you received! Yay! I feel sad that mine won't arrive until after your birthday - because I haven't mailed it yet! But I want to include all the ATCs I made for you, incuding the one for chocolate! I will be mailing your package this week! Yay!! Chocolate!! I was trying to guess what your final ATC theme would be and actually thought about "All That Cake", but I will definitely settle for chocolate anytime. I actually baked a chocolate cake this week and frosted it with homemade vanilla buttercream frosting..yum, so you can imagine my giving you a piece to celebrate your birthday. Oh, so that isn't very satisfying? I understand that completely. so I'll eat your piece too, so it doesn't go to waste. With my being a fellow chocolate lover, I have a lot of chocolate themed stamps that I'll need to dig out for this final ATC challenge week. 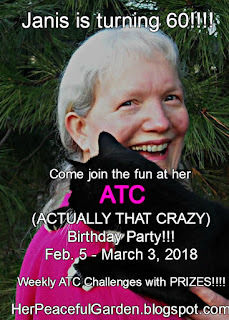 Thanks so much for inspiring us with this unique and fun birthday month challenge and for getting my ATC mojo going again! 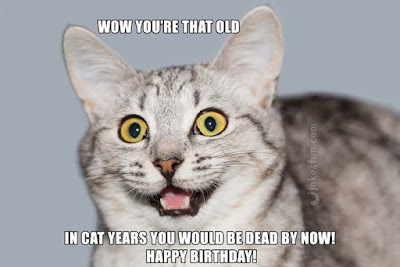 Happy birthday my bloggy friend! Oh goodness, that ATC and card from Gail is just adorable! I love her dapper looking Cat-ifer Columbus and that hilarious Mer-cat ATC. Oh my gosh?!! Take over the world on Monday... I was hoping we could put that off until Tuesday. I love seeing everyone's interpretation of your theme! your ATC is so nice!